Land Rover has added another model to its already expansive range. The Range Rover Velar sits neatly in the gap between the Range Rover Evoque and the Range Rover Sport. Velar debuts Range Rover’s latest Touch Pro Duo infotainment system, with two high-definition 10-inch touchscreens. More about this in a moment. Naturally the Velar follows Range Rover’s long tradition of having a light, stiff, aluminium-intensive body. Keeping weight down not only gives even better off-road performance, but also makes it feel more agile around town and as a bonus it uses less fuel and creates fewer emissions. Almost like a sleek station wagon rather than a 4WD, Range Rover Velar combines fashion and function beautifully. So clean are the lines that the Velar has a coefficient of drag of just 0.32, some low slung sedans can’t manage this. A result of the sensible shape is the boot volume is 558 litres. An interesting feature is the way the horizontal lines along the side are emphasised at various stages by cut outs, and even the door handle housings. About the latter, all four door handles stick out from the side of the Velar as long as it’s unlocked. Looks a bit untidy to our eyes, but perhaps this feature is there to attract attention. New Range Rover Velar is powered by a wide variety of engines; petrol and diesel; four or six cylinders; turbocharged or supercharged. Our test Velar SE had a four-cylinder 2.0-litre Ingenium turbo-diesel. This comes in two levels of tune to provide132 kW or 177 kW of power. Ours had the 177 unit. A V6 diesel has a huge 700 Nm of torque. A 280 kW supercharged V6 petrol engine enables the Velar to reach 100km/h in only 5.7 seconds. A sophisticated all-wheel drive system, class-leading ground clearance of 251 mm (213 mm in models with coil springs), and class-leading wading depth of 650 mm (600 mm with coil springs) show this is no pretty around-town pretend SUV. Traction technologies include Terrain Response 2, All Terrain Progress Control, Low Traction Launch, Hill Descent Control and Gradient Release Control. The Velar debuts the new Touch Pro Duo infotainment system. This has two high-definition 10-inch touchscreens. The upper touchscreen’s menu is divided into three panels for navigation, media and phone. Interaction is similar to that when you use a tablet or a smartphone: swiping across the screen to change between menus, pinching to zoom in and out, and with pressing and scrolling across the screen to pan across maps. 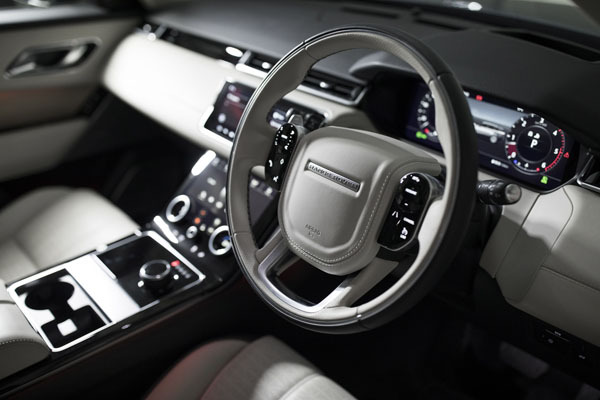 The lower touchscreen is integrated within the centre console and manages features including the climate control and Terrain Response functions. The touchscreens are complemented by two rotary controllers that are configurable to enable them to perform several functions, for example adjusting cabin air temperature, massage seat settings or the Terrain Response mode. And much more. If you decide to take a Velar for a test drive may we suggest you allow at least an hour to let the experts run through the systems with you? There’s just one old-fashioned dial in the system. That to control the volume on the audio system. Which makes a lot of sense as it’s arguably the most used of all controls in all vehicles. Advanced driver assistance systems including Autonomous Emergency Braking with pedestrian detection and Adaptive Cruise Control with Queue Assist, the latter lets you have the Velar drive itself at very slow speeds in heavy traffic conditions – but don’t forget you’re still in charge so never take your eyes from what is happening. Active and passive safety systems are to the highest standard and it will be difficult to get into a crash even you want to. And should one sill occur the Velar will do everything it can to protect all occupants. Sadly our testing was confined to around town running, on-road driving in lovely scenic areas behind our home on the Gold Coast and some boring motorway trips. Realistic, but not what we had planned. Next time we must set aside time for proper off-road testing. But colleagues who have taken the latest Rangie tell us it’s every bit as impressive as they had anticipate from the company that invented luxury off-road travel. The front seats are large and support well, they are easy to get into and out of due to the height of the Velar. Back seat space is good, though if there are tall people in the front they may have to give up a little legroom for similarly built people in the rear. Ride comfort is excellent and there’s the feeling you’re in a limousine rather than a high-level 4WD. The big Rangie brushes aside corrugated roads, potholed suburban streets that have seen better days without the slightest signs of trouble. Handling is pretty good for what it is – a tallish vehicle with a centre of gravity to match. If you want even better handling why not opt for a sedan, perhaps an XJ Jaguar with all that means in the way of true British refinement? 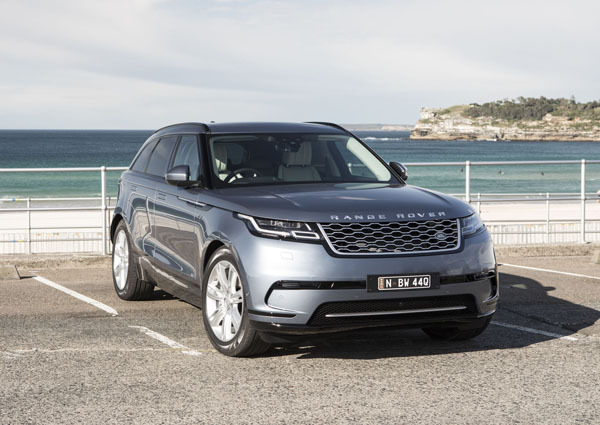 In any case the built in active safety features mean that the Range Rover Velar would hang onto the road, or track, or slimy mud at speeds that won’t be tackled by any sensible driver. Fuel consumption from the smallish diesel typically ran in the seven to eight litres per hundred kilometres on motorways and easy country runs, rising to a still reasonable nine to 12 litres per hundred. 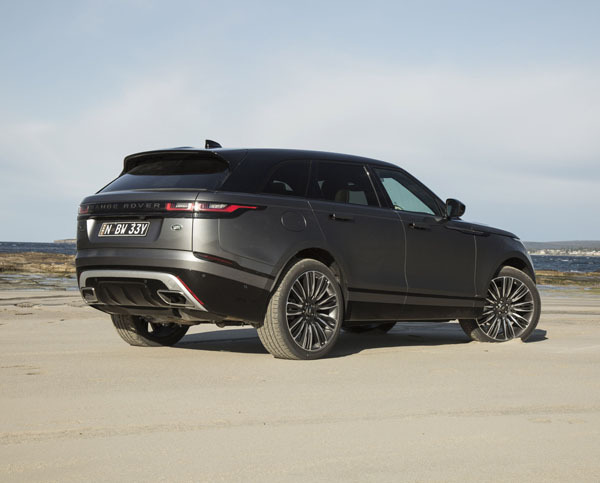 Range Rover Velar has an excellent combination of style, practicality and performance and we suspect many people will buy if for its looks – both inside and out.